ALBANY, N.Y. – Dec. 19, 2016 – PRLog — Several notable media outlets have awarded Leaping Lemmings!, written by John Briggs and illustrated by Nicola Slater, spots on their “Best of” lists, or strongly suggested that family members with young readers purchase a copy for the holiday season. These organizations recognize this picture book’s unique story, bright and whimsical artwork, and strong message about thinking for yourself. In November, The Little Book House in Albany, New York, placed the book on its list of “Books for the Fall Season”, discussing the selection on the local NBC affiliate WNYT’s Live at Noon broadcast. The Society of Children’s Book Writers & Illustrators placed it on their “2016 Winter Reading List”. SCBWI members include some of the best-known names in children’s literature, and is a highly respected organization for its decades-long efforts to bring quality literature to young readers. Northshire Bookstore, with stores in Manchester, Vermont and Saratoga Springs, New York, suggested readers consider Leaping Lemmings a terrific holiday present by placing it in their annual “Holiday Gift Guide”, and then further recommending it on the regional National Public Radio station WAMC’s weekly segment Book Picks. Common Sense Media, a national advocate for quality children’s books, video programming, and entertainment, put it on their list of “Eleven Books Sure to Please Young Readers This Christmas”. Leaping Lemmings has been called “hilarious” by Booklist and “thought-provoking” by Primary Times magazine. The 32-page picture book focuses on a lemming who won’t jump off cliffs with his friends. He remains true to himself in everything he does and eventually teaches his friends how to think for themselves. Several children’s books advocates have called it an important message for our times. Leaping Lemmings is available through Amazon, Barnes & Noble, and independent booksellers nationwide. John Briggs is a longtime book editor and journalist, who spent three years as a nationally syndicated children’s TV critic. He has authored several other children’s books, including Judy Garland: Little Woman, Big Talent, and Mary Dyer: Friend of Freedom. Find out more at johnbriggsbooks.net. 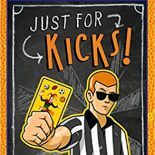 This entry was posted on December 20, 2016 by johnbriggsbooks in Books, Children's Books, Picture Books, Press Release, Uncategorized and tagged awards, book reviews, children's books, holidays, news, picture books.